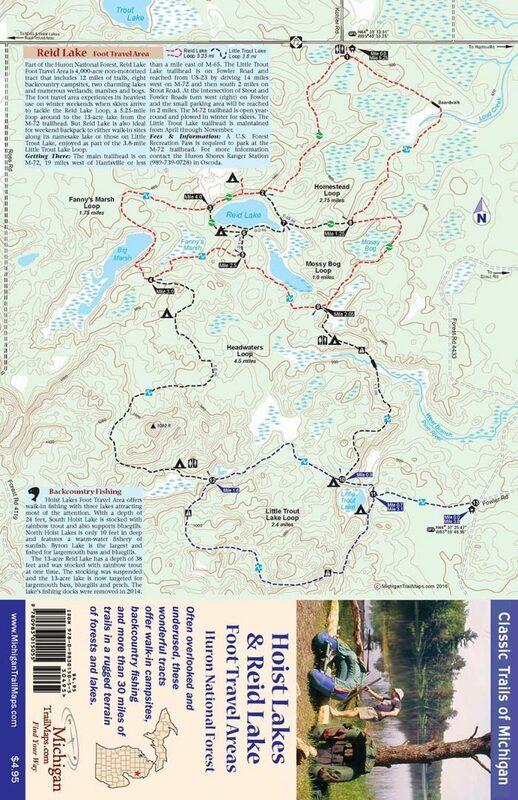 To order a Reid Lake Foot Travel Area trail map click here. Reid Lake is a lovely little body of water that was privately owned until 1966 with some of the surrounding land still being farmed in the early 1960s, as is evident by the open fields and even a small orchard. Eventually the U.S. Forest Service purchased 3,700 acres, designated it a non-motorized foot travel area in 1975 and then turned to the Youth Conservation Corps to help build a 6-mile trail system around the lake. In 1991 the USFS added Little Trout Lake to increase its acreage to more than 4,000 acres and in 2002 began expanding the trail system and series of backcountry campsites. Today the Reid Lake Foot Travel Area includes 12 miles of trails, eight backcountry campsites, two charming lakes and numerous wetlands, marshes and bogs. It is this mix of marshes intermingled among rolling hills of hardwood forests that attracts and supports an abundance of wildlife. That includes mosquitoes and deer flies if you arrive in June or July. Wait until late August when the bugs begin to thin out or, better yet, arrive in early October when there are none and the hardwood forests are burning with fall colors. Reid Lake experiences its heaviest use on weekends during the winter with skiers departing from the plowed M-72 trailhead. But this could change in the future with the area’s expanded trail system. The perimeter of the trail system is now an ideal weekend backpack, an overnight trek of 9 miles to a remote, lakeshore campsite. 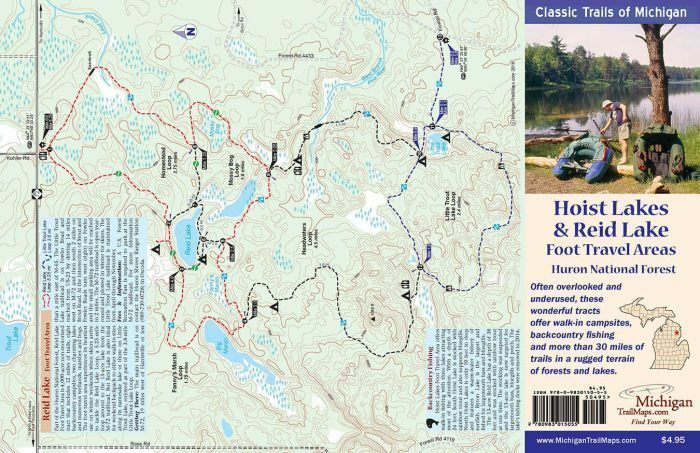 The outing that is described below is the most popular route with hikers or cross-country skiers, a 5.25-mile loop around Reid Lake that combines Homestead, Mossy Bog and Fanny’s Marsh Loops. Haul in a tent and sleeping bag and you can spend the evening. 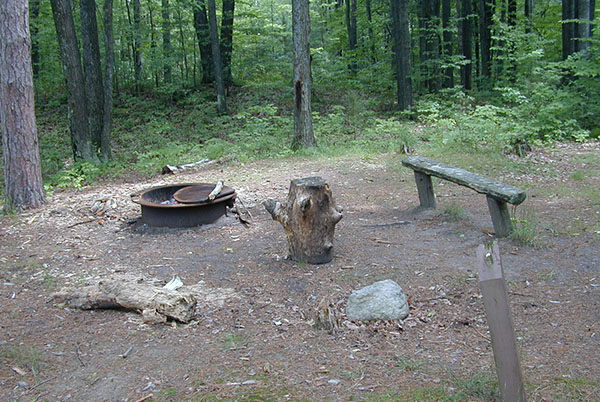 Campsites lie on the north and south side of the lake and feature fire rings and benches. Trekking is not hard at Reid Lake. The trails are well marked with blue blazes, the junctions are marked with locator maps, and the gently rolling terrain contains few climbs of any significance. Even when trails wind around low-lying wet areas, they are surprisingly dry thanks to the old two-tracks that many follow and a series of new boardwalks. From the M-72 trailhead begin by heading east (left) at the display board along a wide trail that follows the gently rolling terrain to post No. 8. Along the way you pass through the perfect rows of a red pine plantation and then break out at your first marsh, crossed via a stretch of boardwalk that keeps the boots dry. From here, the trail makes an ascent to post No. 8, reached at Mile 1.25. Reid Lake is only a quarter mile to the west (right), but head east (left) for the 5.25-mile loop or to reach Little Trout Lake. In the beginning the trail to post No. 9 resembles a former railroad bed before swinging south into a rolling terrain of hardwoods. Eventually you breakout at Mossy Bog and tiptoe along a narrow foot path between two open marshes. This is an interesting area in the spring with peepers croaking and wildflowers blooming but buggy in the summer. The trail ascends away from the bog to return to the woods and arrives at post No. 9 just beyond Mile 2. The trail to post No. 10 heads south (left) as an old two-track and within a quarter of a mile arrives at a backcountry campsite. Heading west (right) to post No. 5 the trail reaches an open beaver pond within a quarter mile and then skirts its west side from above. 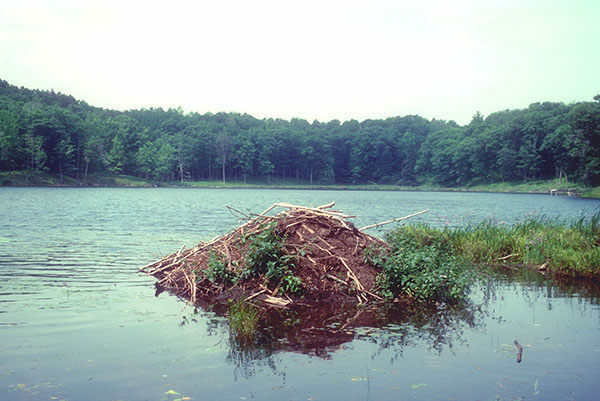 The pond is almost as big as Reid Lake and features a large lodge in the middle while along the bank are fallen trees with the telltale signs of a beaver's handiwork; gnawed marks and wood chips around stumps. From the pond, the trail moves into an open field, makes two sharp 90-degree turns that are well posted, then arrives at post No. 5 at Mile 2.5. You can head straight north to reach Reid Lake, just one low ridge away, but to the west (left) is scenic Fanny’s Marsh Loop around two more marshes. The 1.5-mile loop begins by descending to Fanny’s Marsh and skirting the south end of it. You climb over a low ridge, pass post No. 4 at Mile 3 and then arrive at the east side of Big Marsh, which can be more like a small lake during a wet spring. From the marsh the trail climbs over another low ridge before swinging east and at Mile 4 reaches the northwest corner of Reid Lake at post No. 3. Older maps show a water pump in this area but it has since been pulled out. If you’re not in a hurry to head home there are four campsites on Reid Lake. The more scenic ones are along the south side of the lake and reached by heading south (right) at post No. 3. The pair of sites are shady spots that sit on a bluff overlooking the lake. Head east (left) at post No. 3 to reach two more sites, which also sits above the lake. There used to be three fishing docks on Reid Lake and at one time the lake was stocked annually with rainbow trout. Other species include panfish, especially bluegill, largemouth bass and some perch. The trout and bass are most often caught by anglers who have hauled in a canoe or belly boat, but the panfish can easily be landed from shore. From the north shore campsite, the trail continues east to quickly reach post No. 2. Here you can continue to skirt the lake, a walk of almost a mile, or return to the M-72 trailhead by heading north (left). This final leg is a wide path through the woods and, for the most part, a gentle, mile-long descent to the parking lot. There are eight walk-in campsites in the Foot Travel Area. The most popular are the four around Reid Lake and two on Little Trout Lake. There is no source of drinking water at the trailheads. A U.S. Forest Recreation Pass is required to park at the M-72 trailhead. 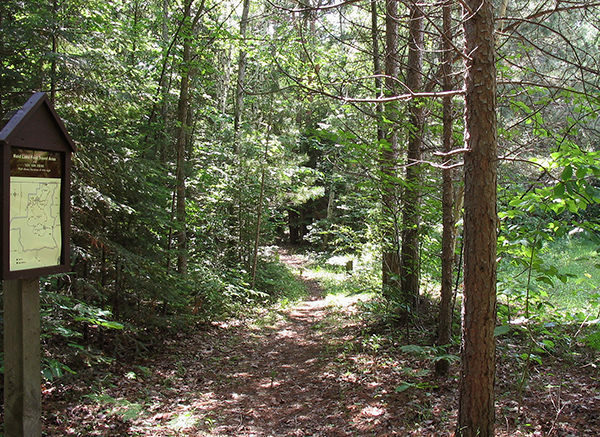 The main trailhead is on M-72, 19 miles west of Harrisville or less than a mile east of M-65. The Little Trout Lake trailhead is on Fowler Road and reached from US-23 by driving 14 miles west on M-72 and then south 2 miles on Stout Road. At the intersection of Stout and Fowler Roads turn west (right) on Fowler and the small parking area will be reached in 2 miles. The M-72 trailhead is open year-round and plowed in winter for skiers. The Little Trout Lake trailhead is maintained from April through November. There are U.S. Forest Service offices in both Mio (989-826-3252) and Oscoda (989-739-0728).